This little guy will look adorable as he digs away in your yard or garden. Put him next to a tree, wall or fence to surprise your family and friends. Sculpted of hand painted polyresin, he'll add a touch of humour anywhere he is placed. Measures 22.8cm x 10.8cm x 18.7cm. 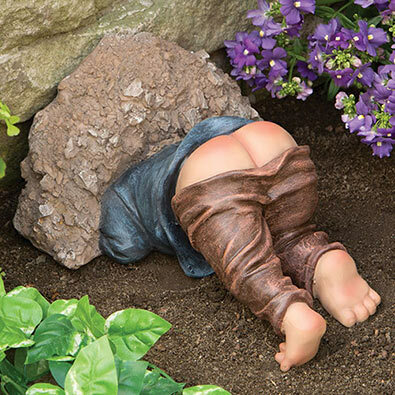 Create a humorous surprise in your yard or garden with the Elfin Tree Peeker! This large garden sculpture is crafted from weather resistant polyresin. Mount his face and hand on one side of a tree with his other hand on the opposite side and he appears to be grinning and peeking from behind. Face measures 13cm x 18cm. This charming fellow will bring luck to your garden and help keep track of your rainfall at the same time. Whimsically sculpted of weather resisitant polyresin and hand painted, the plastic tube holds up to 12cm of rainfall. A wonderful gift for gardeners. Measures 20cm tall x 8cm wide. Hang this cute little elf on your tree or fence and he appears to be climbing out of a wooden window with a swinging metal windowpane. Made of weather resistant polyresin and hand painted with realistic details and texture. Keyhole hanger on the back allows you to hang almost anywhere with your nail or screw. Measures 31cm x 19cm x 10cm. Our gnome is chilling out in a stone pool and enjoying the sunshine. Fill with water to add some whimsy and humour to your outdoor spaces. Place in any garden, patio, by the pool or any other place you need a little fun atmosphere. Doubles as an adorable birdbath. Sculpted of hand painted polyresin to resist the elements. Measures 31cm in diameter x 17cm tall. Our little fellow is just plumb tuckered out. Reading a book after a long day, he has fallen asleep face down in his wooden chair. So fast asleep that his pants have slipped down and a little bird is perched on his behind. Surprise your family and friends with this adorable surprise guest on your patio, yard or garden. Sculpted of weather resistant polyresin, and hand painted with antiqued details. Measures a generous 28cm x 26cm x 19cm. This little garden elf will create a moment of surprise and laughter when placed in your yard or garden. An adorable elfin sculpture with an innocent look of surprise on his face. Made of hand painted polyresin. 34cm high x 13cm wide.